Faster Lightroom editing is easy when you follow these tips. Are you making Lightroom work for you? Some tools, like Lightroom presets, mean you don’t have to reinvent the wheel with each shoot. These three big tips will drastically cut your editing time – and time is money when it comes to making professional edits. You don’t have to edit the pictures on a grey backdrop. Editing on the wrong color can slow your process when the pictures don’t look right later on another program or device. Many professional photographers find it is easier to color correct accurately on a white or black background. 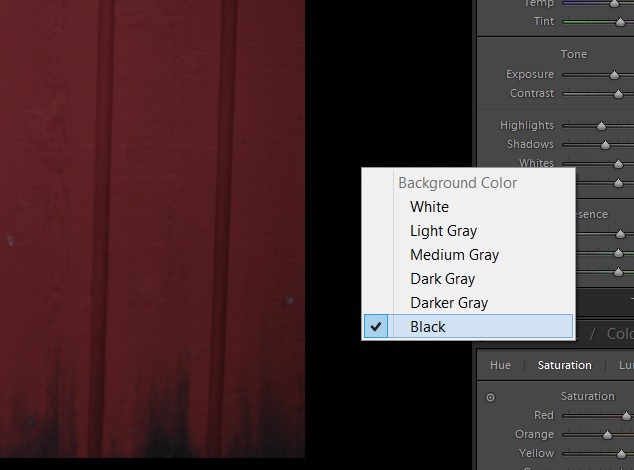 To choose a different background than the default grey, right click on the background next to your image. You will see a dropdown menu pop up that allows you to choose other neutral workspace colors. Delete in camera when possible. There may be breaks during your shoot where you can remove the clearly undesirable ones. Someone blinking, accidental blur and poor exposure are reasons you might delete pictures in camera. Just be careful not to delete anything you aren’t completely sure you don’t want because you can’t go back and remove them later. Thin the shoot. You don’t want thousands of useless pictures taking up space. Go through your shoot and delete the worst ones – ones you are sure you wouldn’t want to use or give to the client before heading to Lightroom to import. Reject pictures. You’ve thinned the herd, but chances are you still have multiple images of virtually the same shot. In Lightroom, you can easily compare by clicking back and forth or pressing C (keep pressing C to reset the view). Once you decide not to spend your time editing a picture, press X to flag it as rejected. Once you’ve gone through and narrowed the images down to the very best, Click on the Photo tab and then Delete Rejected Photos… button to remove those ones you flagged. Now you have a clutter-free workspace to edit only the pictures you want to pass on! Lightroom allows you to edit your pictures in batches. It is far faster to work on large shoots in Lightroom than make individual changes to each image in Photoshop. You can make your corrections in Lightroom and then copy those edits to use on similar pictures from the shoot. You can also save time by batch saving images. But, many photographers aren’t quick at deciding what editing look they want and may not even know exactly what to change to get the stylized look they are going for. Lightroom Presets are the fastest way to edit in Lightroom and they help you think outside your personal box. Here are three examples of our top Lightroom presets that can be used to quickly take your pictures to the next level. ired collection of 58 Lightroom presets are designed to push your photos into powerful directions. If your photography is all about energy and excitement, then the Cinematic settings might be perfect for you! Pops of color with an earthy edit give your pictures a polished look. Turn heads with a touch of drama. With 30 different Lightroom presets, the Vintage Film collection is both stylish and versatile. The flat and washed look of these presets will give your photos a feeling of authenticity in a classic way.